Every year we get more cucumbers than we know what to do with in our little suburban garden. This year we’re doing our best to keep up with the garden and harvest stuff when it tastes best. I pulled our first four to five pickling cucumbers off the vine over Independence Day weekend, and decided to try to actually make homemade dill pickles with them for once. We’ve mostly only eaten them crisp and fresh before – never occurred to us how easy dill pickles really are. We actually made these homemade dill pickles two days ago, and we let them pickle in their brine for at least two days before opening and trying. The brine has smashed garlic, crushed red pepper, cider vinegar and salt making it all delicious. We don’t have plans to keep the pickles long (I’ll be lucky if they last a week with how much my husband to eat pickles out of the jar as a snack), so we didn’t do jar boiling steps to keep them shelf stable for much longer than a few weeks. We opened the jar and tried them after two days – I am not a huge pickle fan or pickle connoisseur, but I think they’re delicious. They’re definitely still crisp after two days, but Luke (who is a connoisseur) prefers a softer, more pickled pickle so he’ll probably dig in more after another day or two. Wash mason jars, lids and lid rings with soap and water. Dry completely. Wash and dry the cucumbers, brushing off any prickly bits and trimming blossoms and ends. The pickle spears should be about a half inch below the top of the jar. 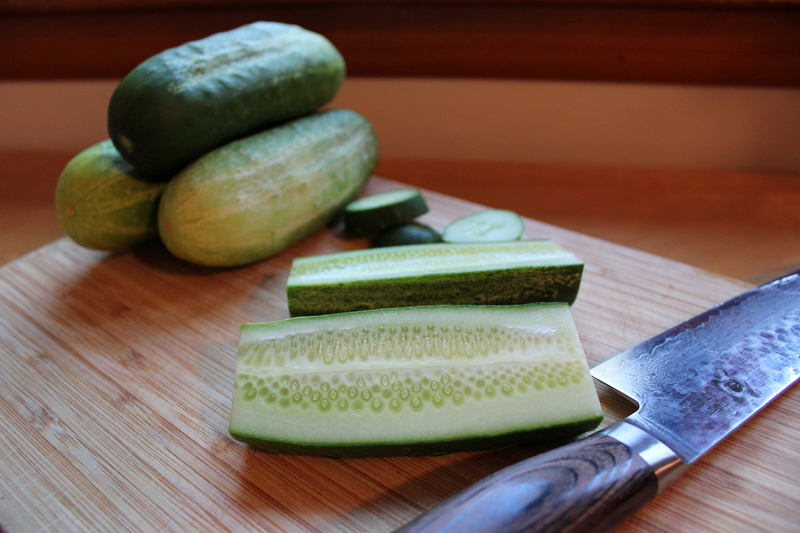 Slice the cucumbers into spears. I got roughly 6-8 spears per pickling cucumber. Peel and smash the garlic cloves. 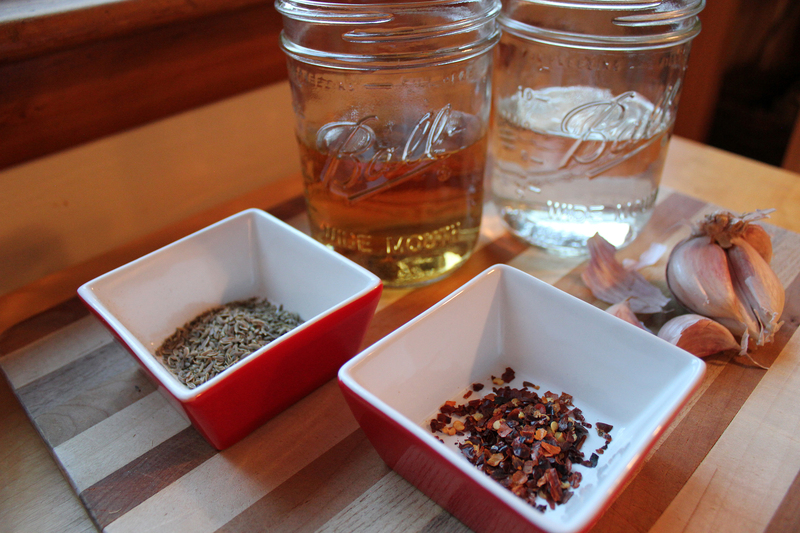 Divide garlic, dill seed and red pepper flakes between the mason jars. Add fresh dill sprigs if you want. 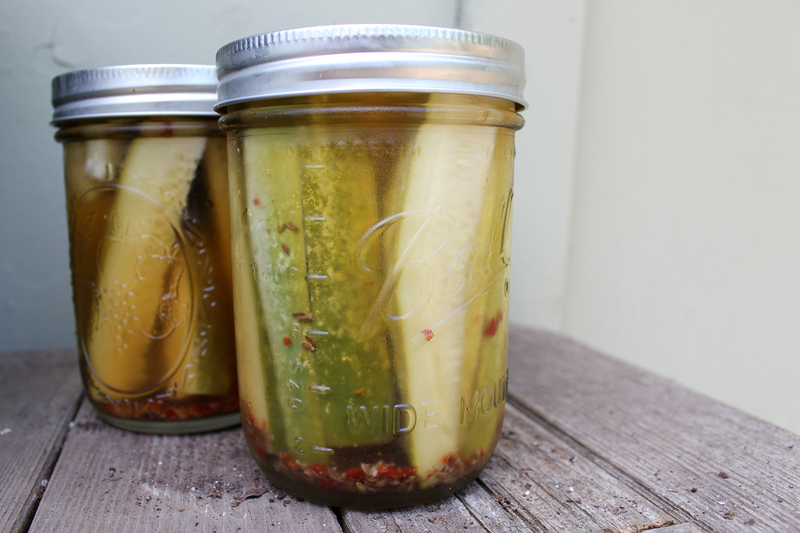 Pack the pickle spears into each of the jars tightly, but without smooshing them. Make the brine by bringing the cider vinegar, water and kosher salt to a rolling boil. Fill each mason jar up to about a half inch below the top of the jar. Tap the mason jars a few times in the counter before sealing to get rid of air bubbles. Put the lids on the jars and screw as tightly as possible. 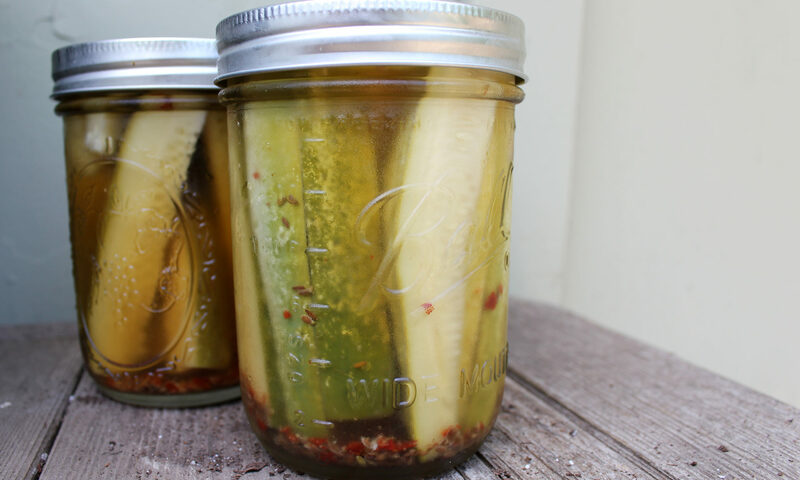 Cool the dill pickle jars to room temperature, then store in the refrigerator once completely cooled. 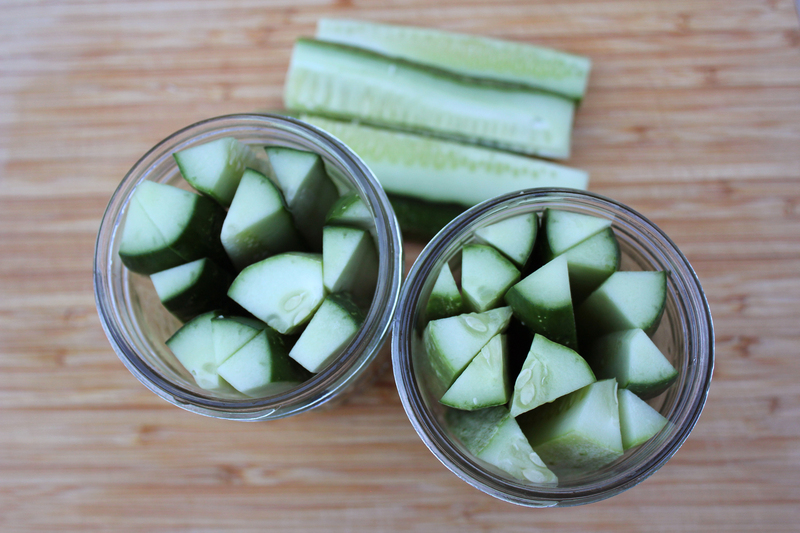 Wait three to four days before opening the jars so they can fully pickle in the brine. They can keep in the refrigerator three to four weeks. Update 7/30: Trying some new variations today! Did some spear pickles with a fresh jalapeño I picked from my garden, and some sliced sandwich pickles with mustard seed. Skipped the crushed red pepper. Hope it works out! My husband is a soldier deployed for the fourth time, this time to Afghanistan. He always appreciates the care packages his family and I send full of books, magazines, healthy snacks – and sometimes cake. Since I bake a cake a week, it would be a real shame not to share the goodies with the soldiers! Baking a jar cake is really simple, and a great way to send a special treat from home, made with love. They keep really well because the heat seals the jar so tightly and it lasts the week or two it takes for the care package to arrive where your loved one is deployed. Here is a handy guide on how to bake jar cakes to send to soldiers overseas. Take the two pieces of the lid and the jar apart. Put the glass jar in a pot of hot water and bring it to boil over medium high heat on the stove. Boil the jar to sanitize it, then remove it carefully from the hot water with tongs to cool. Once the jar is completely cooled, spray the inside liberally with a non-stick spray like Pam or waxed paper with butter. This way the cake doesn’t stick to the edges of the jar too much and it’s easy for your soldier to eat your delicious cake! 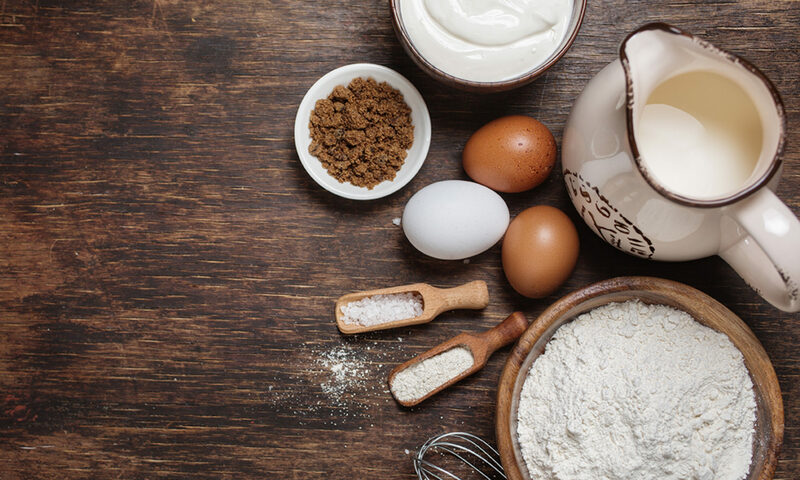 After you’ve made your cake batter (use any of the cake recipes on this site for your cake batter – they won’t be disappointed! ), fill the sanitized mason jar about halfway with cake batter. Don’t forget the cake will rise as it bakes, so remember to only fill the jar half full. Bake your cake inside the jar according to the normal recipe instructions – including temperature. However, it is wise to start checking on the cake about 10 minutes before the normal done time. Sometimes the jar cakes bake a little faster than a full-size cake would. The best way to tell if it is done is to insert a toothpick or skewer tester in the center and make sure it comes out clean. Also, the top of the cake should spring back when lightly pressed. Shortly before your cake finishes baking, boil the two parts of the mason jar lid just like you did the jar itself. Make sure to use gloves so you don’t burn your hands on the jar! Pull your jar cake out of the oven. Run a clean, damp cloth around the rim of the jar to get rid of any crumbs or baked on cake. Screw the lid tightly onto the jar while it’s still hot. Do not frost or decorate the cake. Pick a good, flavorful cake recipe and they won’t miss it, I promise. Some people send a store-bought container of frosting on the side. 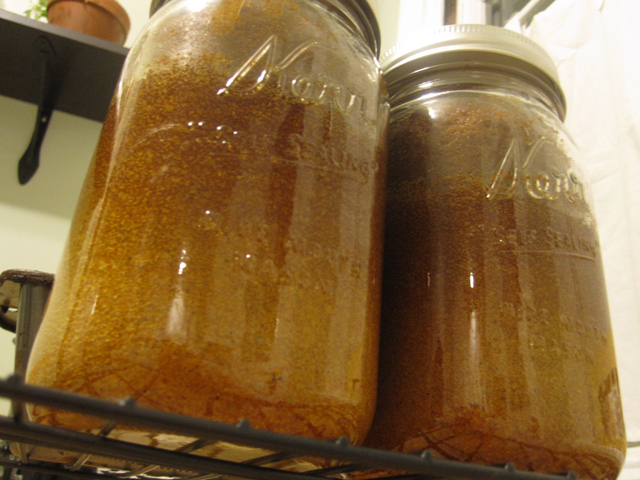 I have also baked pumpkin bread and other breads in jars, and it turned out fantastic. Let your jar cake cool and then ship it out as soon as possible! The sooner the jar cake gets there, the better. Your soldier can run a knife right around the edge of the cake and plop it out of the jar – or if you’re lazy like me, you can just eat the cake right of the jar. Edit: One reader below said it might not be safe to bake breads and cakes in jars because the temperature doesn’t get high enough to guarantee baking off all potential bacteria. She linked to a white paper on the safety procedures that you should read. Mail takes about 1.5 to 2 weeks to get to my husband in Afghanistan and the cakes have been fine, but there is some risk involved. If you do decide to go ahead and bake jar cakes, be sure to sanitize those jars and seal those lids tight, and advise your soldier to check them carefully before consuming! Like this tutorial on how to bake mason jar cakes for deployed soldiers overseas? Check out (and share!) my tutorial on How to Bake, Pack & Ship Cookies to Deployed Soldiers Overseas in Care Packages.